New in 2008! This very affordable property is the least expensive in Point Rendezvous and an exceptional value with air conditioning, a large spa and endless views! It is perfect for one couple, a small family or even two couples. Have dinner on the porch while listening to the sound of the surf. The great room boasts a 20 ft high vaulted(varnished Cypress)ceiling with the master bedroom off the main floor, and, is joined to an upper sleeping level and a laundry level via an ornate spiral staircase. It has two flat screen TV's..one in the living room and the other flat screen TV in the main level master bedroom suite... perfect for late night movies. On the spacious roof covered deck, a large spa stands ready to soothe tired muscles, while you gaze at evening stars in a spectacular setting. WiFi and DSL available. Cellular tower can be seen from the porch. The Rendezvous Bay area begins east of Chocolate Hole and is a 10 minute drive from the Cruz Bay ferry dock. It continues across Fish Bay and beyond, to remote Reef Bay. The VI National Park borders this entire region from the north and the east. Hillside vacation villas dot the landscape, with gorgeous views of quiet bays and manicured gardens. Trails lead to the 'hidden' beaches at Hart Bay, Monte Bay, Klein Bay, Fish Bay, and even spectacular Reef Bay for beach combing, snorkeling, and exploration. Keywords: Over 2400 square foot Villa with 1,2, & 3br, 2 bathrooms, cool breezes, 40' x 12' porch with beautiful ocean views. Great for one or two couples, or, one couple with two or three off spring. I spent 35 years as a consumer products packaging engineer.....many as a manager. Following my Corporate employment, I did recruiting for large medical, pharmaceutical and consumer products companies filling packaging engineering positions...and built and managed my Villa on St. John. Feel free to ask questions about my Guest House. The view, the water, the weather, and some of the most beautiful beaches in the world...I built the Villa as a place where my daughters (Christy & Ann) would like to come to visit and enjoy the beaches with me. Christy Ann (Villa) is great for one couple, or, one couple plus a few off spring. Christy Ann is a family villa not good for equal couples. Due to the Spiral Staircase, children less than 5 years old are not allowed. The view is a primary feature... another are the light cool trade wind breezes, usually eliminating the need for A/C, and blowing away the bugs. 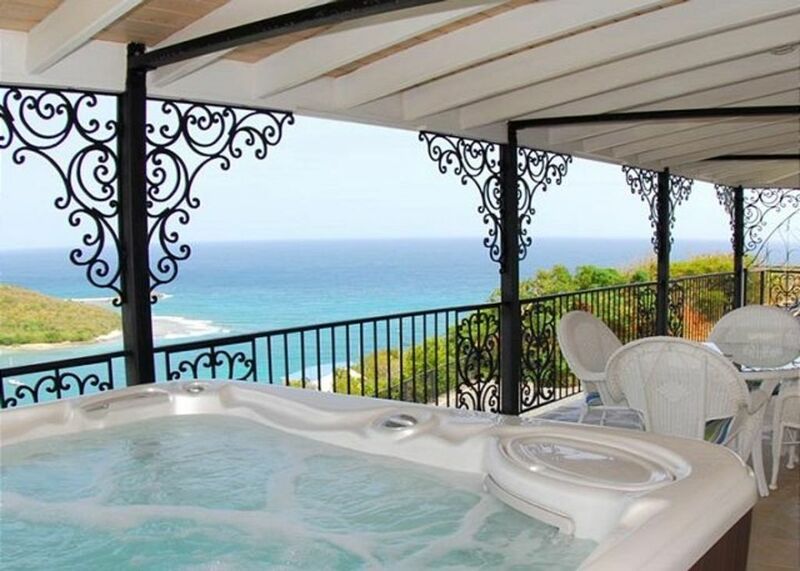 A large private porch with cool trade breezes and large hot tub makes it an important part of the Villa. Drive way entrance is on the South Side road...a paved road. Time required to drive to Cruz Bay is about 5 to 10 minutes....to the north side beaches about 15 to 20 minutes. The Villa has a large parking and turn around area unique to the Island. The 80 percent of the view is of the ocean and Fish Bay. Excellent communications...you can see the cellular tower from the porch...and, the Villa has wifi. The Villa has a vaulted ceiling and plenty of light. The porch and lower Terrance are completely private areas. The Villa has over 2400 square feet under roof ....thus, plenty of extra space. In addition, the lot size is large and the space around the Villa is cleared of tropical brush. Lots of space for parking...one of the largest on the island. Really loved the house, it was really comfortable! We spent a lot of time on the big deck with an amazing veiw! Had air pressure in the water lines, I made the hostess aware, and 10 minutes later someone was there looking at it... that's impressive! The only issues was the hot tub was leaking water and we weren't able to utilize it, but the hostess made us aware of it. Glad you liked Christy Ann.....sorry we are having trouble with the Hot Tub. I have the necessary part in the mail due this coming Monday... April 1st or 2nd to the Villa. It will resolve the leakage problem. We absolutely loved our stay at Christy Anns. It was an excellent location- close to town and the grocery stores. The house was perfect and exactly as described. Just the right amount of space and amenities. The view was spectacular and breathtaking! St John is truly a gem of a place- and I would recommend a stay at Christy Ann to anyone looking for a relaxing and peaceful vacation! We will be back! Thank you so much ! An amazing property with an incredible view! my wife, daughter, and I really loved this property. We especially liked watching sunrises and dining on the back patio. It also has an outdoor shower, big enough for 2 that we really liked. You could always hear the waves! The owner and his people on St Johns were super helpful. They met us at the ferry and gave lots of helpful info about the island. Thanks for writing a view of your stay at Christy Ann. I am very glad that you and your wife and daughter enjoyed it. Hope you will return again sometime. Hope the snow was not too bad when you returned to Wauwatosa, WI. Our family rented Christy Ann for 8 days over New Year's and enjoyed every minute of our stay in the house and St. John! Christy Ann is professionally managed, which is to also say, well managed. Our visit started with the management company's representative meeting us at the dock and escorting us to the house where she showed us all the features the house had to offer and then talked to us about our plans, giving very helpful suggestions along the way. Since we arrived after the sun had set, we weren't able to see the views, but we were dazzled the next morning when we woke up to bright blue skies, the turquoise waters of Fish Bay and a pleasant breeze blowing across the covered patio. Talk about a fantastic setting to have cup of coffee and bagel from the Starfish Market in Cruz Bay! Christy Ann's located on the south side of St. John, about 5 - 7 minutes out of Cruz Bay and situated in a manner that gives it a very private feel though it's still close to shopping and dining. Being there several days, we got to take advantage of the hot tub several nights as well as the washer and dryer, which saved us from having to pack tons of clothes! The owner's also thoughtfully provided all the necessary beach gear (chairs, towels, snorkels, etc) so you won't have to pick up your own. Christy Ann happily didn't sustain any damage from the recent hurricanes and the surrounding area's also in great shape. Overall, the south and west sides of St. John are recovering nicely from the storm. There's still visible damage on the north and east sides, however businesses are open and welcoming guests. I strongly recommend you visit St. John and when you do, make Christy Ann your home away from home as well!! John's party is just the right party to rent Christy Ann to.....we thank him and his party for enjoying the property. We just returned from our 3rd trip to St. John and first stay at Christy Ann. The home is beautiful and the view simply amazing! Includes all amenities needed including items for beach, such as towels, chairs, coolers, and more. The hot tub was a perfect night cap after a long relaxing day of hitting the beach and the trails. The only slight drawback that we had is that it's not the best layout for two couples. With that said, it can certainly work. The master bedroom and bathroom are on the main floor and the second and third bedrooms are on the top floor (above main floor), while the second bathroom is on the bottom floor (below main floor). Layout would probably be best suited for parents with teenargers or children. But it can still work for two couples, just not the ideal layout for that. Home was clean, well maintained, and furnished. The constant breeze keeps the mosquitoes away and the outdoor shower was awesome! We'd definitely stay here again. Thanks again to Peter (owner) and Cimmaron St. John for their hospitality! We had a very nice time in St John and I think that's our favorite island we've visited so far in the Caribbean. We had a great time at every beach we went to and the restaurants were fabulous. We went to Ocean Grill three times just for dessert. We ate there early in our stay and the desserts were out of this world we could not stay away. Christy Ann Villa was spacious, clean, had everything we needed and was perfect for our party. Cimmaron the property management company was also very helpful the entire time we were there. The owner also went above and beyond prior to our trip to answer any questions we had about the island, recommendations for dining, entertainment, rental cars, ferry information, etc. We would recommend Christy Ann Villa, St John and Peter (owner) for a fantastic vacation. You won't be disappointed. Christy Ann is located on the south side of the lsland about a 10 minute drive to Cruz Bay...and easily found by a taxi. The north side beaches are about 15 to 20 minutes away by car. It is a quiet area with a great view.